How about a series of classic baseball portraits? I come across many wonderful photos that really don’t have an elaborate story behind them, except the perfect capture of subject and era, and should be shared. The wildly popular choices aside (Ruth at Yankee Stadium in 1948, Gehrig leaning against the batting cage with a smirk, we all know them), there are many that haven’t been properly exposed to the masses and deserve to be recognized, so let’s do just that. First up, this may be my favorite baseball photo of all time, or at least my current favorite – taken Sunday, August 12, 1956, in County Stadium in Milwaukee by renowned photographer Hy Peskin, a 20-year old Frank Robinson in all his Redleg glory, in the midst of his record-setting rookie season (ROY, then home-run record 38 round-trippers for a rookie, and even led the league in HBP due to his fearless crowding-the-plate batting style), on the cusp of one of the most impressive baseball careers of all time. That said, I would love to report of his offensive heroics that day, but he went a rare 0-4 against Braves’ star hurler Lew Burdette as the Reds lost 8-2, but rebounded nicely to go 4-4 with a HR the following night in the final game of the series. 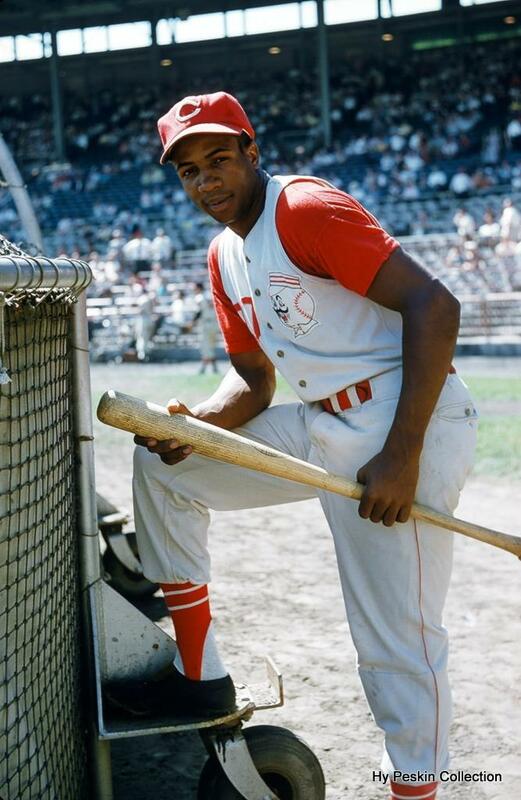 It’s all there: the serious determination and confidence, rare in a rookie player in any sport; the classic sleeveless uniform design complete with the high stirrups of the day, and even Mr. Red himself, the only year that he would appear on the front of a Reds’ uniform. So here’s to you, Mr. Robinson, a definitive representation of a classic era of the grandest of games. When I was a kid, I admired and copied the manner in which Frank R. and Vada Pinson wore their uniforms and shined their shoes to glitter. My father took me to a Sat. DH in Aug. of ’62 (I was 11) at the old Polo Grounds to see the Reds take on the infant Mets (their 1st year). We sat right near the Reds dugout, so for 18 innings my eyes were glued to both stars and their mannerisms. I loved the way they wore their socks – high with a lot of white showing. Their uniforms were tapered, not baggy like a lot of players at that time. Yes, the shoes shiny black (people have said Vada shined his shoes as much as 3 times a game) and every move they made was just so classy. Remarkably,the Reds lost both games and I remember manager Fred Hutchinson not happy in that dugout next to me and my Dad.